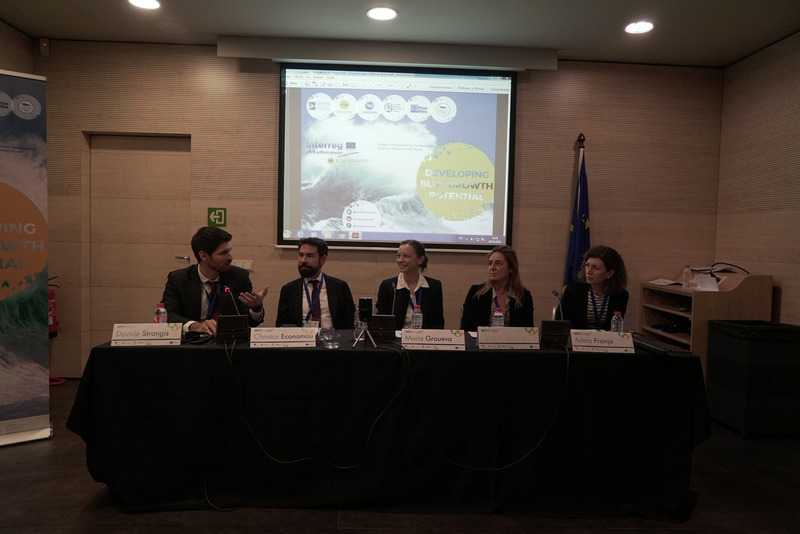 The Blue Growth Community, driven by the InnoBlueGrowth project (Interreg Med), organised its transnational Mid-Term Conference ‘Blue Economy: The Blue Way of Life’ on 22-23 November 2018, in Barcelona, Spain. The conference was co-organised by the CPMR Intermediterranean Commission (IMC), under the coordination of the Association of the Mediterranean Chambers of Commerce and Industry (ASCAME) and all other InnoBlueGrowth project partners (CoNISMa, Plan Bleu, NTUA, University of Montenegro). The Blue Growth Community aims to build a real community of projects devoted to blue growth, as well as reinforcing cooperation between projects and transnational key stakeholders for a better and integrated policy-making. Its Mid-Term Conference represented a milestone for the community, sharing best practices amongst cross-sectoral actors and showcasing the accomplishments of its modular projects to inspire the future of blue economy in the Mediterranean. environment for networking and building synergies among projects and participants. Reflecting on issues such as public engagement and awareness raising, market development, sustainability and clusters in the blue growth context, the discussions also involved external multilevel stakeholders such as opinion leaders, decision-makers, and institutional bodies, funding entities, experts and researchers, targeting all governance levels for better impact. The first day of the conference tackled challenges of sustainability, including its economic, environmental and social dimensions towards improving blue economy initiatives. Following this, the meeting underlined the importance of multilevel cooperation in the Mediterranean basin, fostering North-South collaboration in building a true transversal Mediterranean community through 4-helix partnerships, international clusters, integrated governance approaches and innovative businesses. Finally, the session concluded by defining the ‘blue way of life’, a sustainable and innovative path, creating synergies towards blue growth. Moving to day two of the conference, discussions turned to the future of the blue economy, focusing on the challenges of awareness raising on a sustainable and collaborative blue economy to societies, businesses and policy-makers for an integrated and inclusive growth of the Mediterranean basin. The discussion also highlighted the role of the youth in developing blue economy and its capacity for enabling new jobs, skills, knowledge and technology. 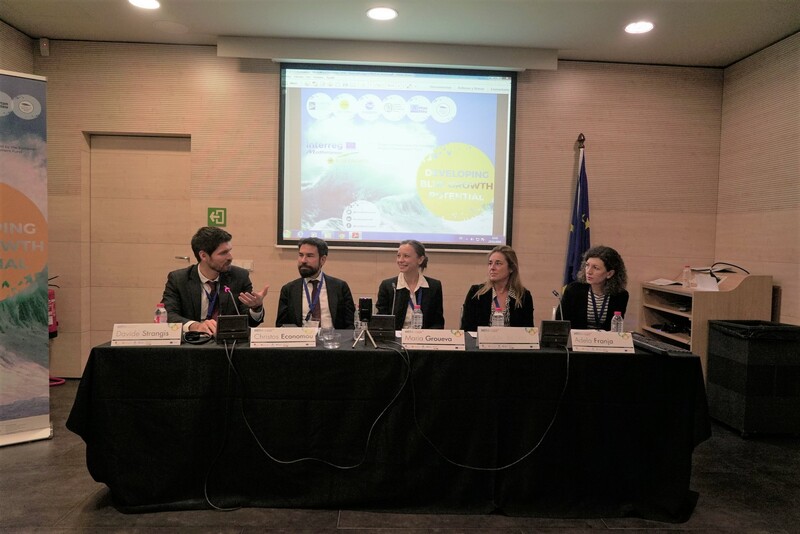 The Mid-Term conference closed with a panel moderated by IMC Executive Secretary Davide Strangis, who explained the necessity for cross-border and maritime cooperation to boost smart and resilient blue economy and a better governance of the sea. It included useful contributions from Mrs. Maria Groueva (Interreg Med) and Mrs. Adela Franja (Interreg Med ADRION), who explained the rationale behind the next calls for projects in their respective programs, focusing on their synergies, transferability and sustainability for the 2014-2020 period. Concluding, Mr. Christos Economou (DG Mare Head of Unit), underlined the importance of the North-South dialogue and the necessity to truly “be Mediterranean” in dealing with the blue economy. 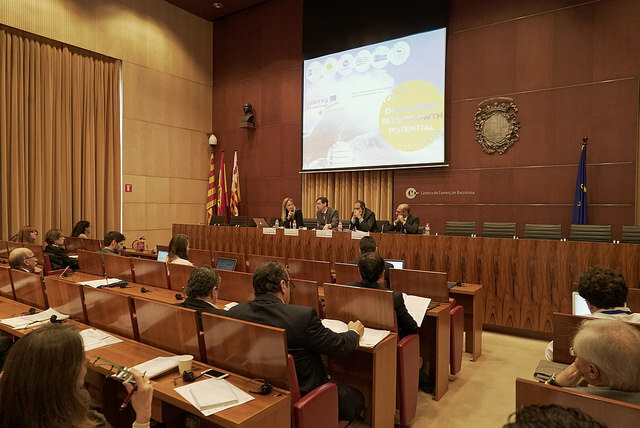 In addition, the Mid-Term Conference offered the opportunity to present the latest developments of the different Blue Growth Community modular and integrated projects: iBlue, Maestrale, Pelagos, Proteus, 4Helix+ and Mistral. They introduced their objectives and the progress achieved to date, presenting effective contributions to the development of the blue economy. The different projects’ representatives outlined their methodologies and implementation processes, demonstrating how they are supporting global sustainability (economic, social, environmental), introducing innovative tools, methodologies, and deliverables applied to clusters, the yachting, blue renewable energies and maritime surveillance sectors. This session promoted the dissemination of information not only on developing project results, but also on blue economy opportunities to the whole Blue Growth Community. The event took place in the framework of the MedaWeek 2018, an event organised by the Association of the Mediterranean Chambers of Commerce and Industry (ASCAME), which added significant value to the Blue Growth Community’s mid-term conference a and ensured high visibility across various media channels, including social media. The InnoBlueGrowth Project has been developed with €1,47 million funding (of which €1,25M is EU co-funding) in the framework of the transnational cooperation program Interreg Med.